A native of Old Bridge Township, N.J., Dolphins defensive back Minkah Fitzpatrick expected to see around 30 close friends and family members in the lower-level seats at nearby MetLife Stadium. The standout rookie didn’t envision over 1,000 aqua-and-orange-decked fans cheering for him and his teammates from the upper deck, their raucous reception rendering the return to his home state even more special. 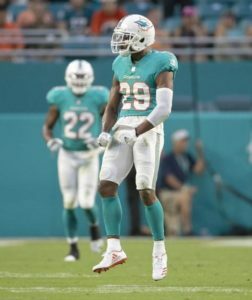 Fellow first-year player Jerome Baker, in awe of the inescapable crowd noise, reached out to Renzo Sheppard, Dolphins Football Communications Manager, to find out why Miami had such an overwhelming presence on an opposing team’s home turf. Thank you @DolfansNYC for all the fans out here today!! We felt it! #MetLifeTakeover Thanks so much! For two of the Dolphins’ top offensive stars, the ringing celebrations following Miami’s scoring drives didn’t go unrecognized. Running back Kenyan Drake, who found the end zone on a six-yard run in the first quarter, echoed a similar sentiment. Drake, much like his other teammates, reiterated his appreciation for the support, and hopes to capitalize on the positive momentum as the Dolphins head to Foxboro for a pivotal matchup against the Patriots on Sunday. What’s his message to Dolfans NYC?